Likely named after The Doors song "Peace Frog", this little store has been cranking out good vibes for years now. They sell T-Shirts, sweatshirts, hoodies, stickers, hats, accessories, jewelry and more. All with the theme that peace is a good thing and we should make it happen. Left over from the hippie days? Maybe. Are they selling the right signs? Definitely. They have wonderful gift items for adults and kids. 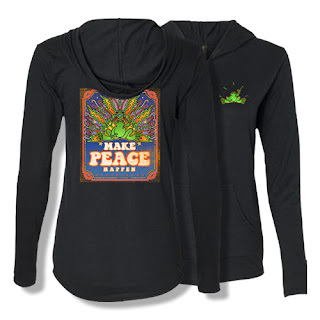 Today I am showing you one item that I received to show and that is their Make Peace Happen Adult Women's Sweatshirt/Hoodie. It comes in Black and comes in sizes S, M, L, XL and XXLARGE. On the front it has a little silk screened frog and the word "Peace". On the back is silk screened the large image of a the word PEACE drawn in a rainbow with a frog and underneath the words "Make Peace Happen". It is a very lightweight hoodie. Best meant for fairer weather or to layer with other shirts and or a sweater. I love all of their merchandise, after all I am but a hippie born in the wrong era. I would have probably run after The Doors and Jimi Hendrix had I had the chance! Their other merchandise is all beautiful T-Shirts: environmental T-Shirts, psychedelic T-Shirts, humorous T-Shirts, Sports T-Shirts, etc. Stickers for your car, boat, locker, etc. All kinds of gift ideas. They even have items for dog owners. Peace Frogs is a great place to find gifts for just about anyone, male, female, adult or child. Like Peace Frogs on Facebook: http://www.facebook.com/PeaceFrogsCompany; Follow Peace Frogs on Twitter: @lovepeacefrogs/; Follow Peace Frogs on Pinterest: http://pinterest.com/lovepeacefrogs/; Follow Peace Frogs on Instagram: http://instagram.com/peacefrogsco and Follow Peace Frogs on Google+: https://plus.google.com/114202920236816580636.